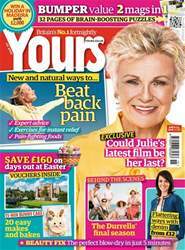 (0 Customer Reviews) | Write Review 26 issues per year Yours is a fortnightly lifestyle magazine and website targeting women aged 55 and over. 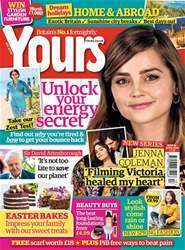 It covers many of the issues and interests of women in this age range – health, relevant news, fashion and beauty that is affordable and wearable, nostalgia triggered by events in the world today, connecting readers with others and campaigning on key issues such as caring. Its readers are at the heart of the brand – its essence is for you, with you, by you. Looking for Yours in print? Unfortunately pocketmags.com does not sell print copies of Yours, but all is not lost. Our partner at magazine.co.uk sells print subscriptions at the best prices online. 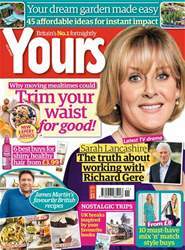 Yours is a fortnightly lifestyle magazine and website targeting women aged 55 and over. It covers many of the issues and interests of women in this age range – health, relevant news, fashion and beauty that is affordable and wearable, nostalgia triggered by events in the world today, connecting readers with others and campaigning on key issues such as caring. Its readers are at the heart of the brand – its essence is for you, with you, by you. 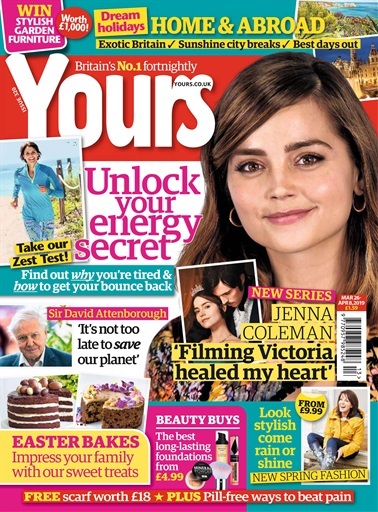 You'll receive 26 issues during a 1 year Yours magazine subscription. You'll receive 26 issues during a 1 year Yours magazine print subscription.